Dovo 116 5851 Forestal Straight Razor, 5/8 Inch Full Hollow Ground Carbon Steel Blade, Cocobolo Wood Handle, Germany. 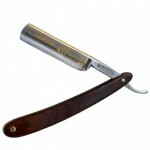 This style is the finest straight razor edge produced by Dovo, and it is very delicate and extremely sharp. The handle is excellent quality one-of-a-kind Cocobolo Wood. The blade is 5/8″ wide. The carbon steel blade has these advantages: the edge is easier to sharpen and the blade generally holds an edge better. However, if not dried properly, or if it is exposed to humidity or dampness, a carbon blade will rust. The blade has a very fine and vulnerable cutting edge. Cutting other materials than beard hair may damage or destroy it. Careful stropping of the blade before shaving maintains the blade’s cutting ability for several months, but too much pressure on the strop can damage the fine cutting edge. After use, the blade and handle have to be cleaned and dried carefully. In case of long term storage, the blade should be lubricated and entirely covered by oil. Comes safely stowed in a beautiful blue metal presentation case.